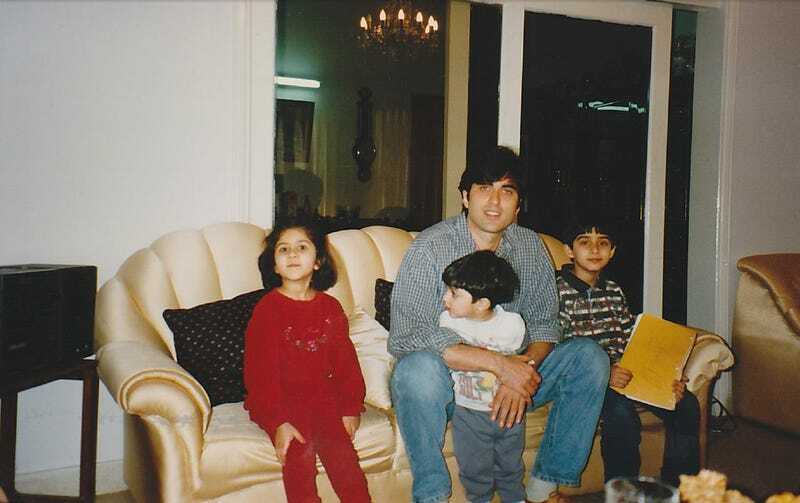 Junaid Jamshed, center, with the author, age 7, right. Via the author. On December 7, Flight PK-661 on Pakistan International Airlines crashed in northern Pakistan, burning through a swath of foliage as it tumbled down the mountainside. None of the 47 people aboard the aircraft survived, and early reports from the scene—once the inferno around the wreckage had subsided—told of bodies charred beyond recognition. Within hours of the crash, what was already a calamity revealed itself to be a national tragedy. Junaid Jamshed, one of the founding superstars of Pakistani pop music, died in the wreck. Jamshed was 52, with a thick beard obscuring what had once been one of the most famous faces in Asia. More than a decade ago, he had sworn off popular music amid a religious rebirth and devoted himself to life as an orthodox Muslim preacher. Controversy and fortune followed him. Through his personal journey, disastrously cut short, from shy engineering student to pop megastar to evangelist, he embodied the story of a nation. Over the course of his career, Jamshed became an avatar for Pakistan and its people—whether they will admit it or not. I am part of a generation of Pakistanis born in the late ‘80s and early ‘90s who grew up with the songs of Jamshed and Vital Signs, the band with which he achieved national admiration. Even after I moved to the United States with my family as a young child, Vital Signs was the soundtrack to innumerable car rides and family gatherings. In Pakistan, the band’s sound—a hybridization of synth-pop and pop rock with South Asian melodies and Urdu lyrics—was both ubiquitous and revolutionary. Western-style pop was not new to the country, but it had never been presented in such a compelling package—especially with the advent of music videos, full of color and vibrancy. At the forefront of it all was Jamshed, with the bright voice, good looks, and charisma to be an icon for millions of people. But the country’s political situation was what truly paved the way for Vital Signs’ iconic run. The group burst into the national imagination in the late ‘80s, as Zia-ul-Haq’s decade-long military dictatorship came to an end. Their boundless energy became the sound of the country’s optimism. The song that made them famous was “Dil Dil Pakistan”—literally translated as “Heart, Heart, Pakistan,” or more loosely as “Heartbeat Pakistan”—released in 1987. At first listen, the song is a simple patriotic anthem. But almost exactly a year after its release, a plane crash ended Zia’s life and his military dictatorship. As the country jolted into a new political era, “Dil Dil Pakistan” became Pakistan’s unofficial soundtrack, its heartbeat. It’s difficult to overstate its popularity or ubiquity: “Dil Dil” rang out over the radio, under TV ads, and at sporting events. From then on, Vital Signs and Junaid Jamshed were household names. And the trajectory of these pop stars—Jamshed in particular—would continue to track the society and politics of Pakistan. Before the music, Jamshed was an engineering student who sang for fun. Born into an Air Force family, he moved around the country following his father’s postings. He attended the Air Force high school in Karachi for a few years before moving north for college. Many who knew him then describe him as shy, studious, and always polite, an unlikely candidate to become the extroverted, attention-loving frontman of Pakistan’s pop music. After the success of Vital Sign’s self-titled debut album, their music grew more introspective. Their early hits gave way to more emotionally complex songs dealing with heartbreak, disillusionment, and loss of trust. These coincided with the slow miscarriage of the country’s attempt at democracy. After their final record Hum Tum (Me and You) in 1995, the band split up. Jamshed had long been rumored to be unsatisfied with Vital Signs, and that restlessness had become a part of his lyrics. But at the center of the split was something bigger, a conflict that continues to roil Pakistani culture today: the feeling that the Western-style pop of Vital Signs lacked the spirit of South Asia’s own musical traditions. Both Jamshed and producer-keyboardist Rohail Hyatt, the band’s introverted creative heart, seemed to want something deeper, perhaps more spiritual. Urdu lyrics and South Asian melodies were not enough to counter the sense that something essentially South Asian was missing. In the end, it fractured the band. Hyatt went on to steep himself in traditional South Asian music, ultimately producing a hugely popular series of records combining Pakistani folk and devotional music with jazz, funk, and symphonic instrumentation. That path on which everyone walks? Where no one’s been before? That record came out in 1999. Later that year, a coup d’état overthrew the weakened democratic government. A new military dictatorship, led by Pervez Musharraf, took control of Pakistan. The 9/11 attacks represented a pivotal moment for Pakistan. As Musharraf’s government attempted to support the war in Afghanistan, the civilian population of Pakistan saw an unprecedented wave of terrorism and insecurity. Pakistani society steadily became more conservative and outwardly religious, a development accelerated by the fallout from the invasion of Iraq in 2003 and complications in the Afghan war. Jamshed, who retreated from public life in 2001, emerged in 2004 and announced that he had sworn off popular music. Dressed in traditional clothing and sporting a pious beard, Jamshed declared his newfound devotion to an orthodox branch of Islam and his intention to preach the faith. From then on, he would only release hymns and devotionals. But that didn’t stop Jamshed from being a public figure—one with which people still had a deeply personal connection. Former fans accused him of turning on them; religious fundamentalists later accused him of committing blasphemy during one of his sermons. Still, beneath the surface, it was clear that he still found joy in his old songs. He would reference or occasionally even sing them during public appearances, a sign that the young man who became the striking face of a vibrant, optimistic Pakistan was not completely gone. I met Junaid Jamshed in 1996, when I was about seven years old. Through the web of Karachi society, relatives of ours who were friends of his family set up an opportunity for us to visit him at his home. I took along a spiral-bound notebook for his autograph. His mother and wife sat and chatted with my mom while we waited for him. When he walked into the room where my sister and I were sitting, he seemed like the tallest man in the world to me. He shook our hands, taking a few minutes to talk with us and pose for photos. When I think back to that meeting, a brief encounter with my childhood idol, it’s hard not to mourn the man he was: an icon for 200 million people, the impossibly handsome and talented focal point of Pakistani pop culture. Pakistani music fans never got to find out if that Junaid Jamshed disappeared with his religious revival. Now, after his tragic death, we will never know for sure. But Jamshed never stopped being a reflection of his country’s evolution: the son of an Air Force family who perished in a plane crash—just like Zia, whose death opened the door for Vital Signs’ early national rise to fame. The music world lost many titans in 2016, and what made those losses so impactful was what they represented. David Bowie, Phife Dawg, Prince, George Michael—all of these musicians channeled the imaginations and emotions of their fans in deep and intimate ways. They became incarnations of their followers’ experiences. Junaid Jamshed was this kind of artist. To understand his contradictions and conflicts is to understand much of what animated Pakistani society over the last three decades—and what continues to animate it today.